Taxi today, more or less as booked, and in good time for the 0709 to New Street, a 4 car 158 of which ‘our’ set was ex-FNW and quite civilised. On from BHM to BHI in a Voyager with the usual atmospheric effects. Excellent performance by ‘Oh won’t you’ whose 737 left BHX spot on at 1015 and got us to PRG early enough to get the 119 bus at 1323 off a booked 1320 arrival! Problems then with R706, 30 minutes late arriving and 25 late departing from Praha hl.n. behind 362 175. Still 25 late from Holešovice (new curve into Mas from Lysá direction noted under construction) but reasonably serious effort thereafter. Round the avoider to Ústí nad Labem západ (it joins the Střekov line east of západ, but the main line west of západ). 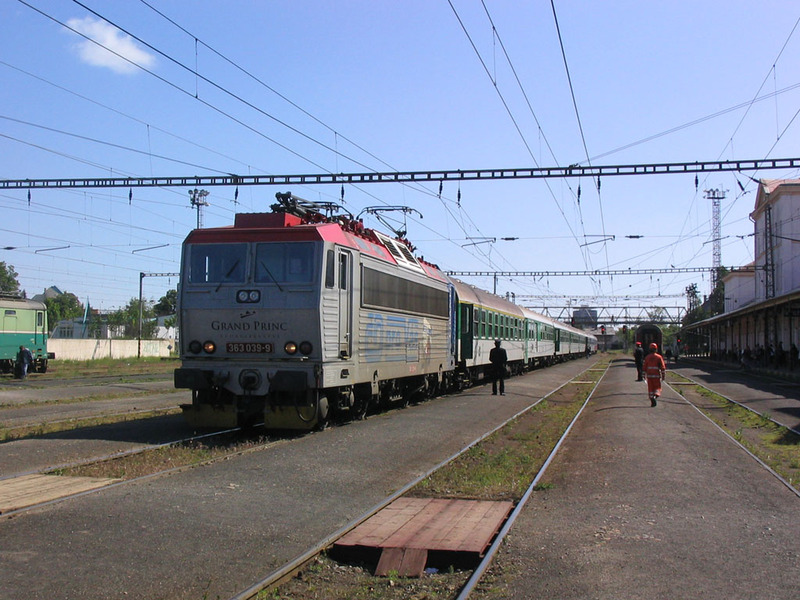 Reassuringly, we were ‘only’ 20 late at západ (21 late leaving) so we pressed on to Teplice to get the last 50 metres from the ‘branch’ platform at zapad to the main line junction [a complete waste of time as it turned out]. Back from Teplice on the 1728 local behind 163 098, with a hasty change at Ústí západ on to a Lysá local worked by 460 075. Baled out at Střekov and returned on a loco hauled stopper with 163 092, verifying beyond all doubt that the line to St?ekov has two unidirectional flyovers! Also noted was a fireless industrial kettle [should this be a Thermos?] working at the chemical works at Střekov. Into the hideously smoky, but amiable enough buff at západ for a celebratory Zlatopramen. Thence on Sp 1617 (163 hauled) to Ústí nad Labem Střekov, again, for a quick change to 810 600 and line 073 at last (my previous attempt had failed due to an un-spotted timetable change). 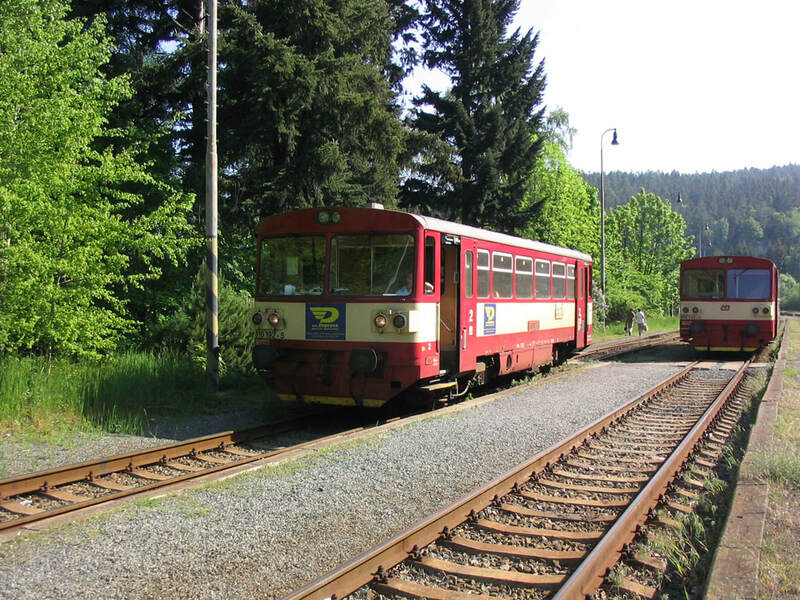 Line 073 provided a pleasant amble along the right bank of the Labe/Elbe to Děčín východ where the physical connection turned out to be beyond the station, vindicating my plan to go through to hl.n.! On arrival at Děčín hl.n. we found that there was an ‘R’ train at 1951 [which we should have missed] but it was 10 late so we ended up back at východ at 2006, exactly the planned time. A nice stroll was had down to Děčín východ for 0757 to Ústí, running 7 late for the 7 minute connection at Ústí and powered by 854 212. Onwards on a 12 late R610 (off the same platform thus rendering last night’s trip to Teplice a complete waste of time as well) behind 363 039. Half an hour at Chomutov, so there was time for a totally revolutionary departure from routine, with Žatec beer taken in the other station buffet (shock, horror). It’s in fact rather better appointed than the one which sells Louny, and has Žatec on draught. 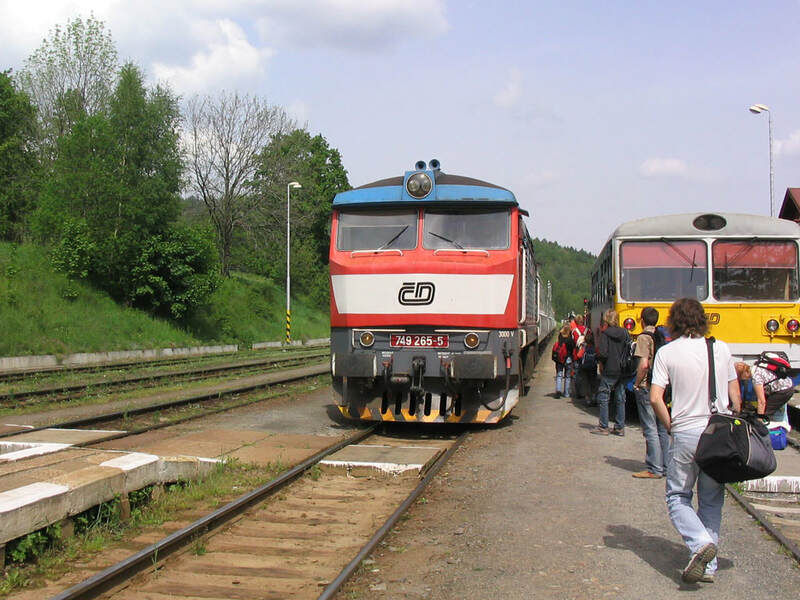 810 297 provided onward transport to Žatec on the 1028 to Lužná u Rakovnika; we baled out there for a 5 minute connection to 810 046 working 1103 to Žihle – a line with more hopyards than you could shake a beer bottle at! 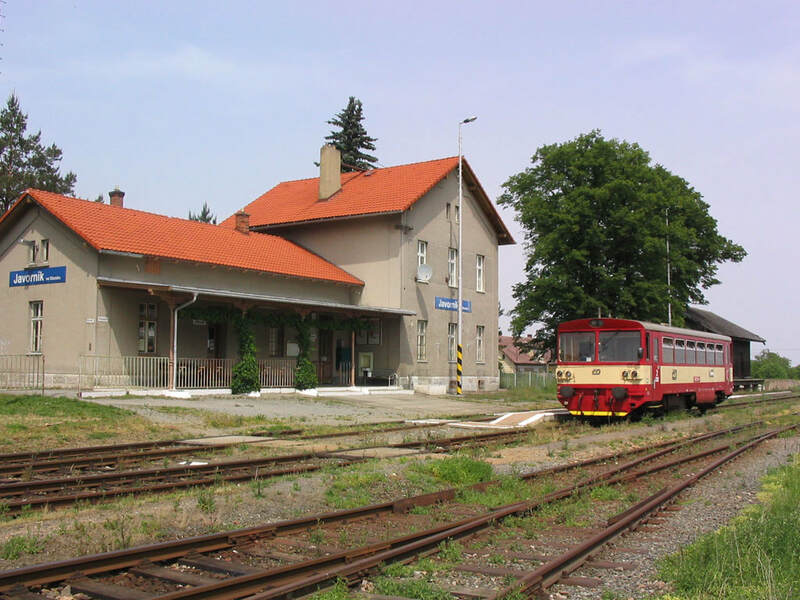 Inexplicable timetabling followed – two wheelie bins arriving at Žihle from Žatec and Plzeň, swapping passengers and working back whence they came. 810337 (with cloth seats like 297) was working the Plzeň end, and took us down to Plasy to await the ‘R’ train back to Žatec. All the carry-on at Žihle allowed the two bins to stop on adjacent tracks and a few metres apart, with the potential for a seriously irritating gap! At Plasy we walked over the bridge, had a look at the (exceptionally run down) monastery and decided that really the pub at the station end of the bridge was the place to be. And so it was – large English menu and a Krušovice, sitting outside under the parasols. Back to the trains then, pausing at the pivo shop for a couple of Gambrini at a modest CZK25.50 the pair. 843 012 waited, and waited, for the bustitutes to appear, leaving around 12 late in the end. This was maintained all the way to Žatec – to my surprise the 1603 ‘R’ to Lužná (R1533) was held so 854 035 had the pleasure of our company as far as Lužná (new track for me Žatec – Krupá). Weird manoeuvres at Lužná where 714 215 came in with three wheelie bin trailers, coupled up to the rear of our 854’s trailer and the whole ensemble headed off towards Praha. Who knows. Meanwhile, the museum was inaccessible so we hastened back to the station for a slightly late 1713 to Rakovník formed of 714 226 and three bogie railcar trailers. Comfortable enough and the minute or two late was of no consequence. Hotel Sole is very pleasant, has English speaking receptionist, breakfast from 0600 and seems generally admirable. 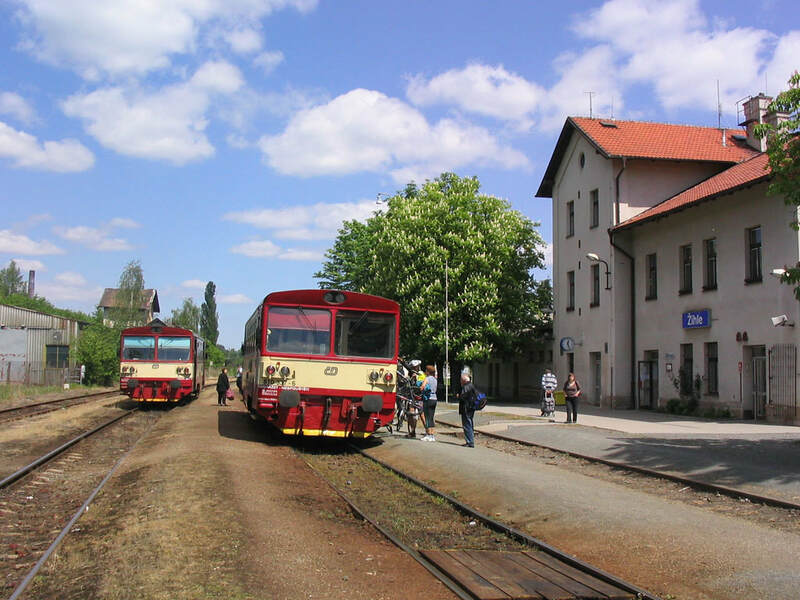 810s meet at Žihle on the Žatec-Plzeň line. 810 046 on the left was first to arrive as Os6554 Zatec-Žihle; 810 337 arrived from Plasy, returning there as Os7643. Plasy to Plzeň was bustituted on that day (18.5.07). Later in the afternoon 708 001 was waiting at Lužná u Rakovníka with a short freight. At Lužná u Rakovníka 714 215 and its three 'wheelie bin' trailers which had arrived from Rakovník were attached behind 854 035 and its two trailers which had worked in as R1533, 1543 FO Chomutov-Lužná. The whole ensemble then departed as Sp1897 to Praha Mas. If a little expensive – but a nice breakfast, cheerfully served at 0645 (and rapidly cleared away, Czech style), so what the heck. Off to the station for 0737 to Louny, manned by 810 529 with one trailer. An hour’s wait at Louny at least gave us the opportunity for a couple of bottles of Louny Old Sheep before continuing with 810 129 to Slaný. All of this on a morning nice enough to make even a well filled wheelie bin a pleasure. The ‘velo’ train over the newly reopened [to passengers] KBS 121 comprised 810 103 (cloth seats) and a trailer with bike logo. As far as Hostivice the passenger complement was 4 cyclists (alighted Kováry), 4 ladies with journey purpose unknown (alighted a bit further on), one very old lady with her shopping bag, one young lad joining intermediately and travelling one station. Oh, and a UK gricing party of three. Some leaflets regarding bike routes, and the Slaný town tourist flyer, had been distributed. A very pleasant run, particularly the first half from Podlešín, after which it’s fairly flat. The descent into the Czech Republic’s capital, on an almost empty 810 wandering along a single line, is hard to grasp when you compare it with London or Berlin (or Brussels, or Paris, or Amsterdam, or…). A gentle wander over to Praha hl.n. for EC109 ‘Comenius’ to Česká Třebová , reached around 14 late for our (held) connection to Třebovice, a Přerov-bound Os hauled by 163 039. After waiting for connections from all and sundry, this left at 1611, 10 late. Still late at Třebovice but the Chornice connection (solo 810 254) was held and all is well. So far. And at Chornice, where we were slightly early and the pub at the end of the station drive was blessedly open, Gambrinus and ice cream were available, which seemed to keep the whole party happy. Away from Chornice on time with 810 159 for a very pleasant trundle down to Kostelec, with cabaret provided by the two station cats at Dzbel, who clearly thought that ‘two’s company, three’s a crowd’. 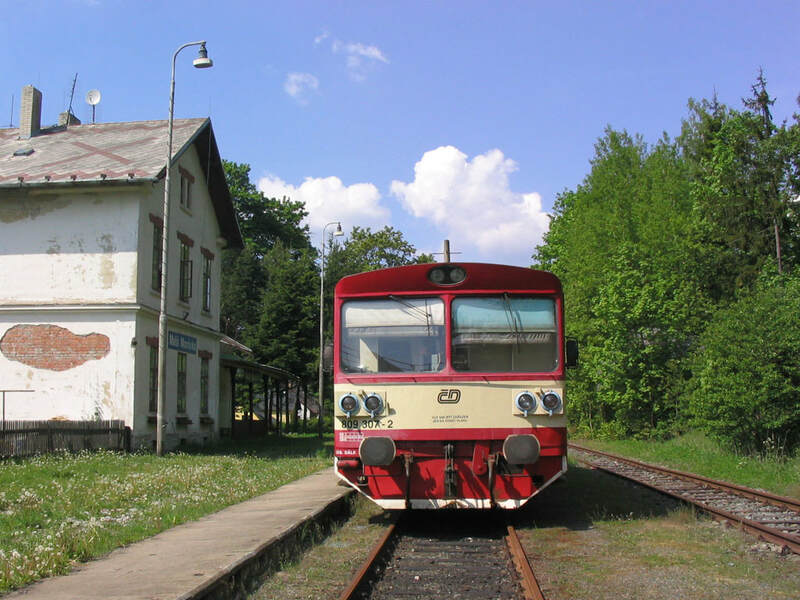 Near disaster at Prostějov where we discovered on arrival that 2000 Nezamyslice was 20 late. And so it was, behind 362 112. It didn’t bode well for a 4 minute connection but ČD, bless them, held it and 163 087 just made it to Přerov in technical daylight, ending an excellent day’s grice with the unexpected 121 (reopened a few weeks ago), the thrice attempted and twice failed 271, and the previously bustituted remnant of 300. The hotel ‘na Jižní’ was an experience – though very smart, the receptionist was on her first day and took half an hour to check the three of us in. Still, what do you expect from a hotel charging 800 CZK a night. A kindly conductor allowed us a very brief photo opportunity at Noutonice on line 121. The railcar is cloth-seated 810 103. 19.5.07. Despite the music, the bowling and the bar to 0600 [that’s what it said on the hotel’s website anyway] a pretty good night’s sleep! Away to the station at 0635 to grab a sandwich for breakfast and join the 0700 nearly all stations to Olomouc hl.n., hauled by 163 074. The Sp from Olomouc to Opava is 851 021 and two trailers; hopes remain high for the inking on of 310 to Domašov, bustituted on our previous attempt. The errant R909 (see 25.2.07) turned up on time this time, just before we left, and had its electric removed in favour of 749 250. The kart seemed to be struggling, with timekeeping slipping back to about 8 late; I’d worked out a plan B doing Vrbno first (to avoid the bus leap from Malá Morávka to Vrbno), which seemed to be at some risk. Timekeeping improved however, and the Bruntál-Milotice bustitution if anything seemed to catch up a bit of time. Mind you there was an attempt to put us in the river due to meeting a 4x4 on a narrow bridge where coaches were clearly not expected! Plenty of time at Milotice anyway, where 810 192 (privately operated) was waiting. 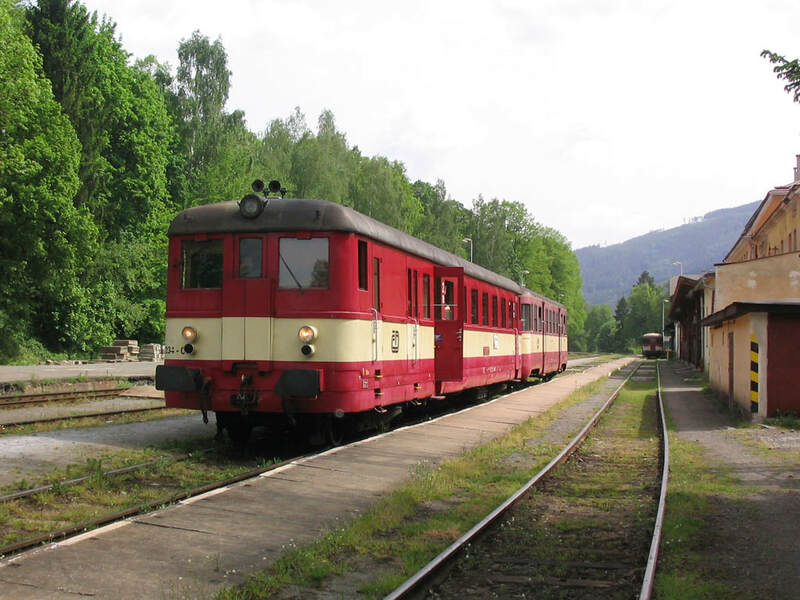 It was of course positioned to avoid any risk of doing the physical connection… Off to Vrbno pod Pradědem up another very scenic valley line, the fare being a pretty modest CZK 16 each way. Vrbno has a pleasant outdoor drinking establishment across the road so we were able to sacrifice principle on the altar of Holba (Hanušovice). Back to Miltoice and thence to Bruntál on the same bus but without the ‘scary’ option, arriving pretty much on time. 843 021 took us to Valšov for the Rýmařov branch which had 809 209 as wheelie bin of the day. This is a less attractive line with a fair amount of industry. 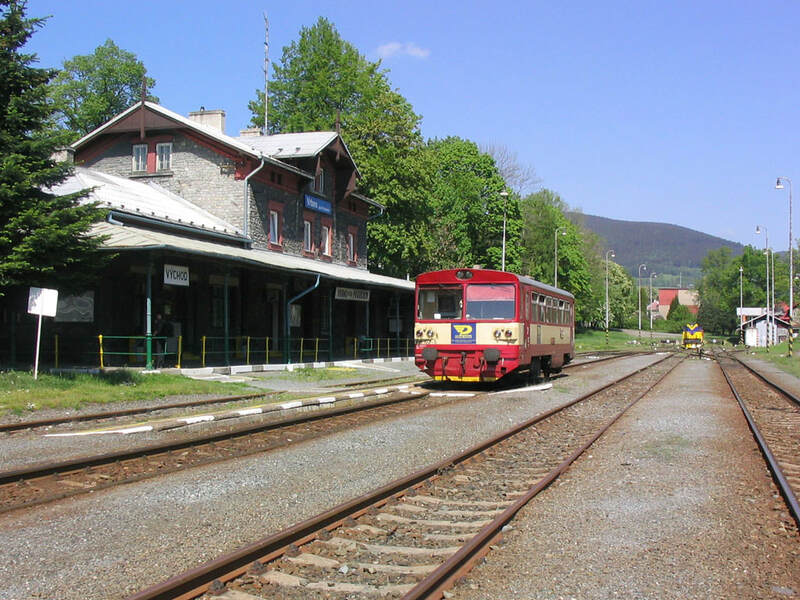 It had occurred to us that there was a possibility for doing the home brew pub in Rýmařov if there was a later train back. 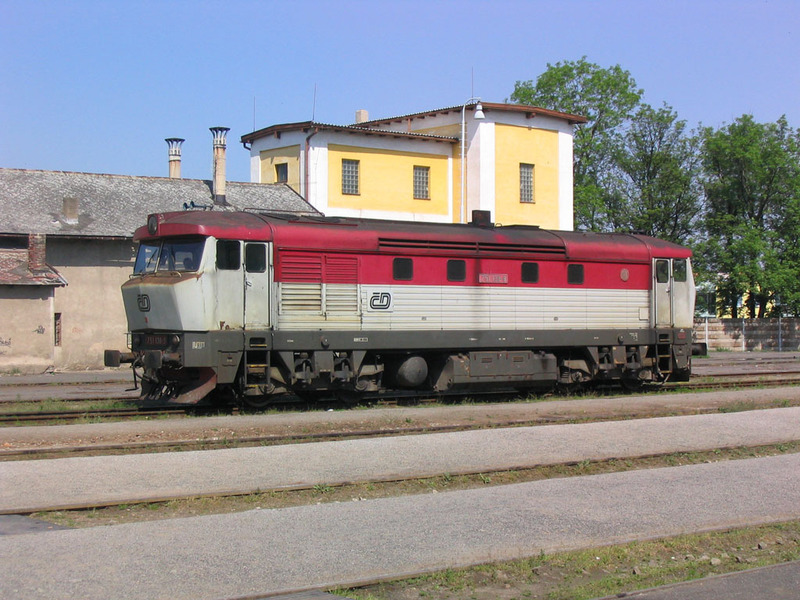 This was indeed the case, with the bonus that the 1320 runs through to Bruntál, doing the physical connection at Valšov. So off we went to the Hotel Excelent (20 minutes uphill, hot) only to find that it appears to have stopped brewing. We made do with Zláty Bažant and retired hurt, though mollified by the Valšov connection! Back at Bruntál (serious refurb going on) we had time for a swift Starobrno before joining 809 307 for the 1434 to Malá Morávka. Delayed 10 minutes waiting connection from Olomouc, we were the only passengers but after last night’s experience it would be churlish to complain. The branch is quite a spectacular one with some large scale views towards the mountains to the north, and southwards back over Bruntál. It ends with a mile or so of steep descent into Malá Morávka. We started out from P2 at Bruntál, running directly on to the branch, but on the return crossed over into P1. This left P2 fir the 1600 Krnov, 810 142 and a trailer, which obligingly did the physical connection for us as it set off to Krnov. 2 out of 3 today – not too bad. But it was all we got. Arrival 16 minutes late at Třemešná ve Slezsku (after a failed attempt to get to the hotel and a delay waiting connection from Olomouc) was met with a bus, and the news that the narrow gauge loco had failed with no prospect of trains until further notice. When that could be, they couldn’t say. Fortunately it was only 3 minutes (plus 15 late) until the next ‘R’ back to Krnov – but Osoblaha is going to be a real pain… Back at Krnov we made our way on foot to Hotel Pepa which is in the centre of town and perfectly acceptable. A very pleasant meal was had, which made us feel a bit better about Osoblaha. It was agreed to petition ?D to rename it Osodifficult. 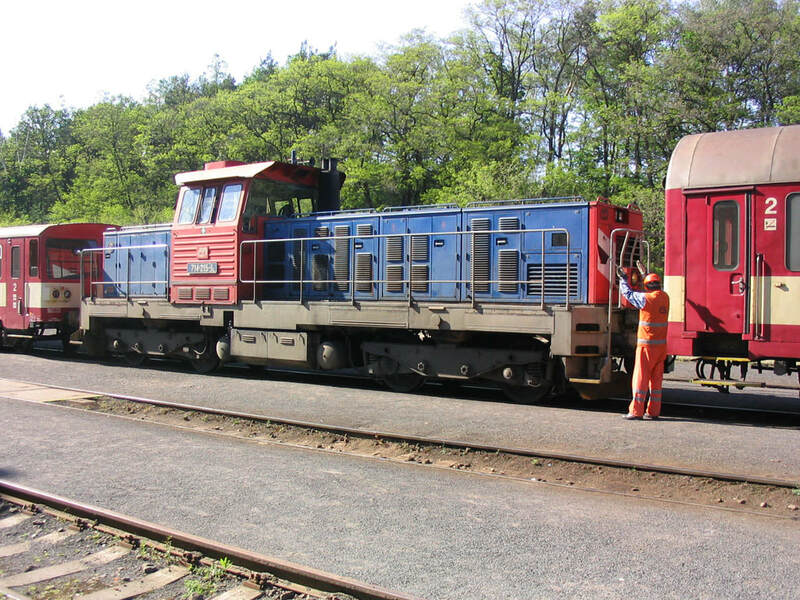 On-hire 810 192 waits at Milotice nad Opavou to work Os 13512 to Vrbno pod Pradědem. 192 stands at the attractive terminus at Vrbno. Off the picture to the right, a freight line continues a short distance to some factories. 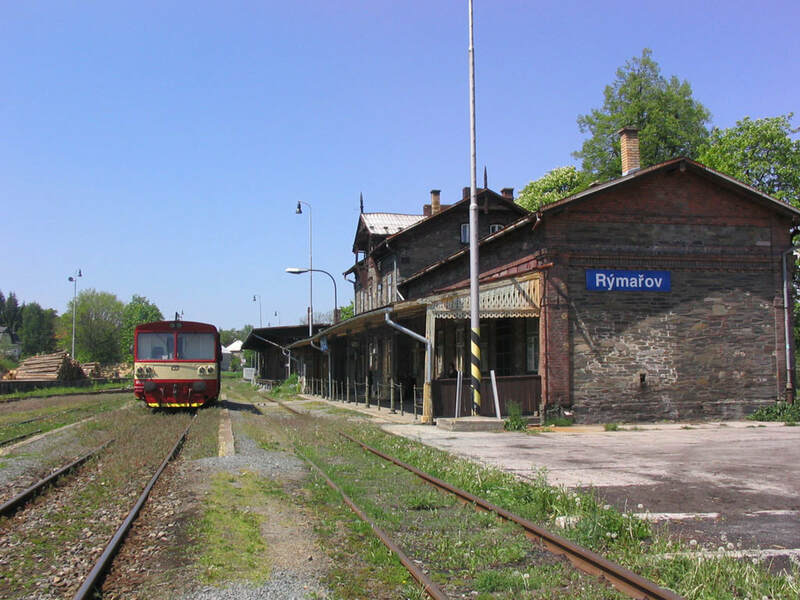 Next up was Rýmařov, where 809 209 was on duty. Not the most impressive of breakfasts (some fruit juice would have been nice) – but OK for the ham and cheese brigade. The walk down to the station, though warm, was easier going than last night. 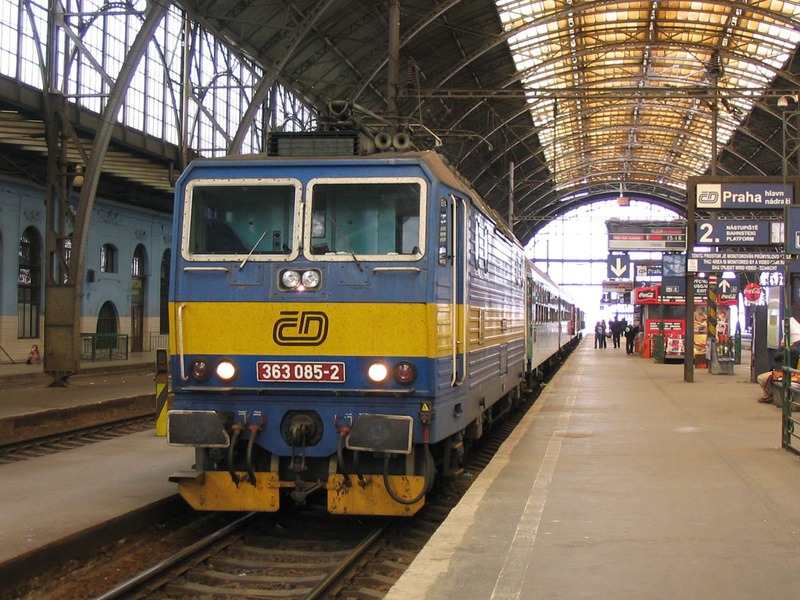 Bogie railcar haulage (pushage to Głuchołazy) for the cross border ‘R’ to Mikulovice for the Zlaté Hory branch. The cross border in fact crosses the CZ/PL border twice, being a korridorzug with reversal at Głuchołazy. The branch wheelie bin was 810 508 which was delayed by a late running connection (itself delayed by our Rychnik). 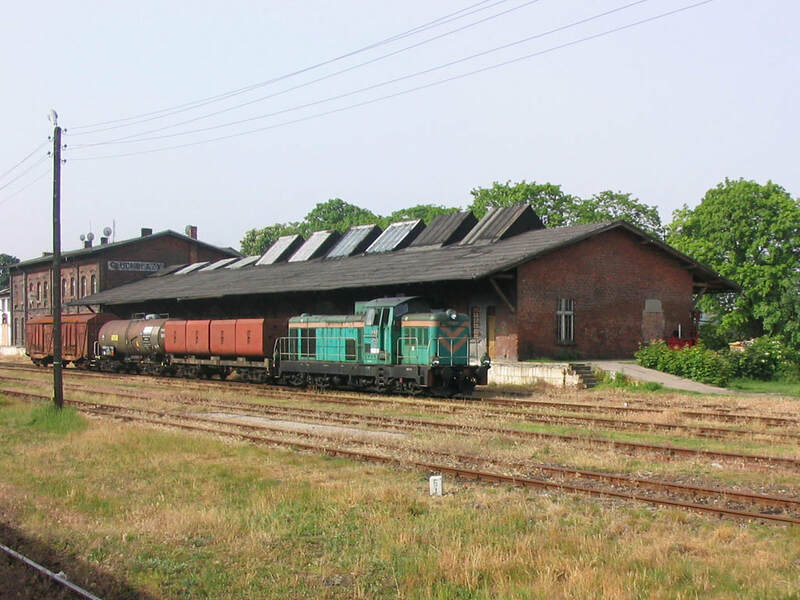 The branch is a fairly short and unassuming one, with a disused industrial branch trailing in at Ondřejovice. No time to look at the end of the branch as we were 15 late on a 5 minute turnround! Back on the wheelie bin through to Jeseník (contiguous with overlap – but a gap at Mikulovice!) where a quick Gambrius Premium was taken in the buff (and cans of Holba thoughtfully obtained by PR). 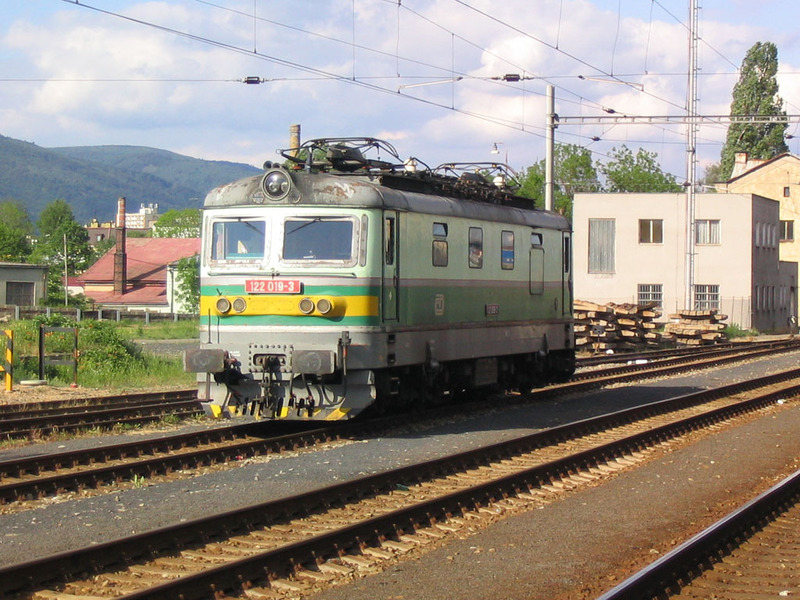 831 234 provided transport to Lipová Lázně. For some reason 810 055 was parked on P2 here – the 831 was on P3 and the branch goes north, all of which means doing the physical connection! Sadly not the case at Velká Kraš where 810 675 was one track nearer the branch than where we came in! 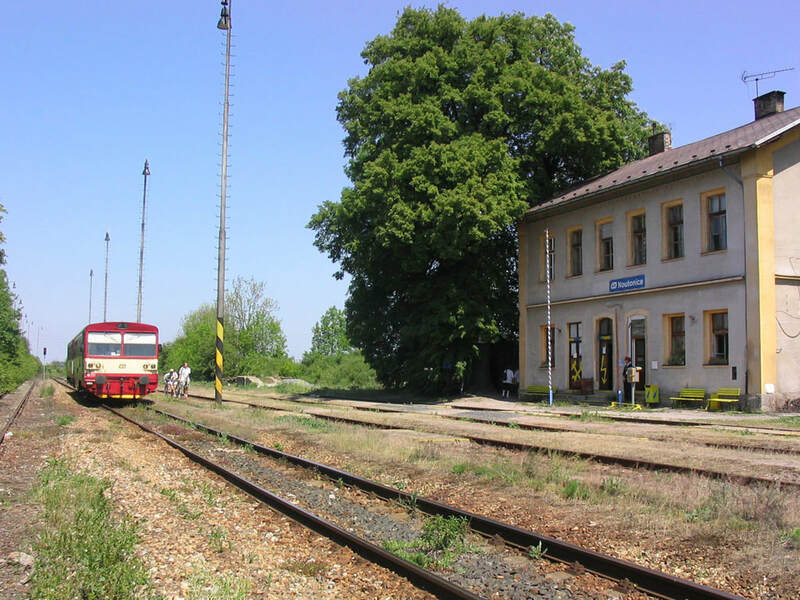 The short branch to Vidnava is pretty unexceptional if you discount the speed with which the 810 was moved into the shade at Vidnava for its 1¾ hour layover! Then followed one of those sequences of events that make Eurogricing so worthwhile. A taxi to Javorník would save us 2 hours. None was evident [hardly a surprise at a poorly patronised station in the Czech boonies]. We walked up the drive and enquired at a garage. Only Javorník or Jeseník, quoth he; go to the Greek restaurant in the square and they’ll phone for you (all this in pidgin Czech/German and sign language). We went. No particularly Greek-looking places so we went into the nearest bar and enquired. The barmaid gave us a taxi firm’s card. I rang it – no English so gave my phone to the barmaid, who elicited that it was no longer a taxi firm… Proprietor was then involved and conducted a search through the phone book before throwing in the towel and telling us he’d take us when we’d finished our beers. Of the ride to Javorník, possibly the less said… [I did make some notes on the subject but it seems completely appropriate to keep them to myself! This was a very kind gesture by the publican and we did our best, I hope successfully, to make sure that he went back to Vidnava feeling suitably compensated for his effort and expense]. On arrival we set off up the station drive to find a fortuitously located Portakabin (OK, slight exaggeration) selling Holba. You really couldn’t make it up. More lily-gilding followed, with our 810 going into the required line at Velká Kraš. Brilliant. Back to Lipová Lázně without incident, and then on to Zábřeh na Moravě with our only diesel haulage so far, 749 265. Disaster ensued as usual at Zábřeh, with our onward connection to Kolín delayed 45 minutes by what seemed to be a loco failure. Still a chance for the Velký Osek north curve though, so all is not lost. Lateness was maintained all the way to Kolín with any gain offset by being looped for a Bendyleano to pass. On the approach to Kolín there was a lurch to the right and we ran in on the Havlíčkův Brod line, so must have done a connection east of the depot. The train was too long for the platform and we decamped on to the ballast (with some other passengers). This earned us a shouting-at from the conductor though as the train shot straight off to Praha-Libeň before we’d even reached the platform I don’t know what else she expected us to do. First class too! Off to Pension Harmonie in a cab this time, to find the road being dug up! At least Harmonie was open (see 3.9.06). H and I returned to the station for 2021 to Velký Osek, a blessedly air conditioned City Heffalump. 15 late (par for the course today) so a quick nip across at Velký Osek into a northward (equally blessedly) facing 810 which proceeded to Sány via the north ‘curve’ and on to Chlumec. Back on the same wheelie bin at 2133 but in the dark by now – also via the north curve, not that I could tell in the dark until we reached V.O. In fact it took so long I mistakenly thought we’d gone by the southern route! On 21.5.07 we made a very brief trip into Poland on R880 between Krnov and Mikulovice. 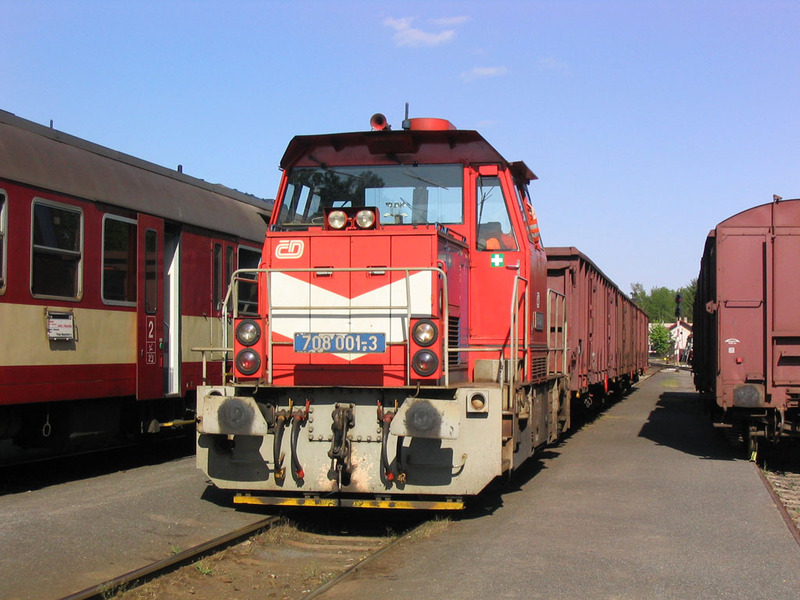 This unidentified Polish diesel with its short freight was standing just outside Głuchołazy as we passed. 831234 stands at Jeseník on 21.5.07 before departure as Os 3608 to Lipová Lázně and points west. At Javorník ve Slezsku station, an 810 was waiting to take us back to Lipová Lázně. 749 265 was working R906, 1435 Jeseník - Brno hl.n. which took us as far as Zábřeh. It's pictured here at Lipová Lázně. 21.5.07. Nothing much on the railway front today. Having succeeded at Velký Osek last night we were able to stay for breakfast at 0730 and potter down to the station for Ex520 (Zlín – Praha, dep Kolín 0845). It was 15 late in the (by now) time honoured tradition, but was at least blessed with an open first with air con at the rear, in which we rode to Praha hl.n. in relative comfort. A very large blue kettle (556 or something) was noted on the left after Libeň and before the tunnel. A touristy walk by the river and over the Charles Bridge, then tram 12 to Malostranská and the Metro to Dejvická for the inevitable 119. Back on BMIbaby and CT, all very efficient (CT – amazing! ).